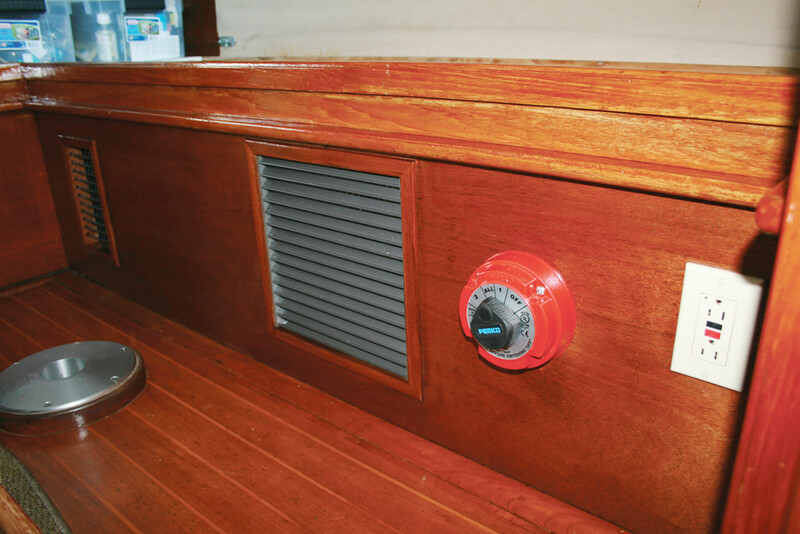 Looking to replace an old or inefficient AC unit on your boat? 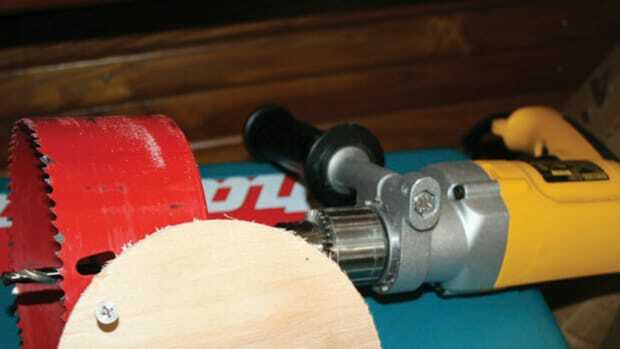 All you need is a few simple tools, a little forethought, and these 6 steps. 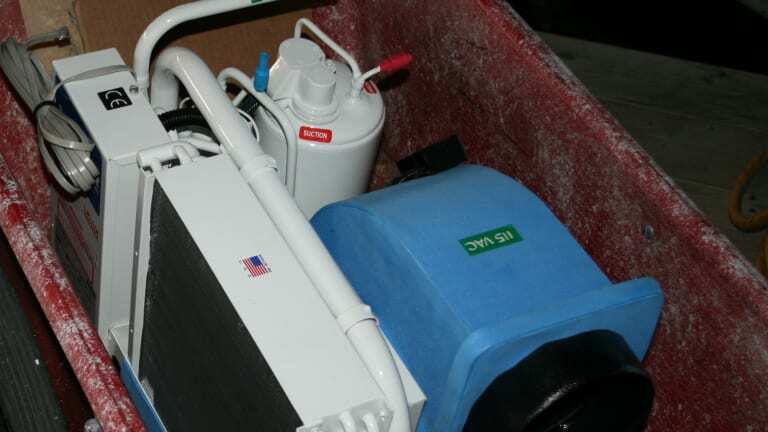 Replacing an old, inefficient, or obsolete self-contained air-conditioning unit is easy—all you need is a few simple tools, a little forethought, and a comprehensible set of instructions. Capt. 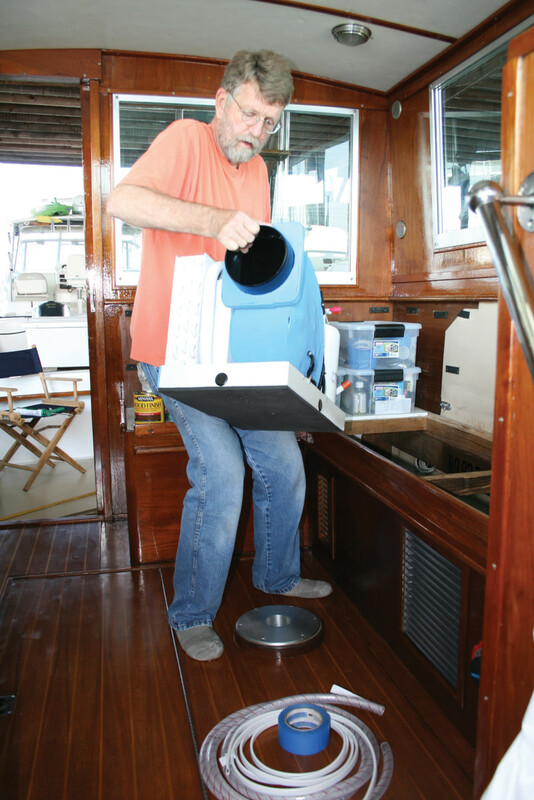 Bill’s Aqua-Air replacement weighs just 68 pounds! 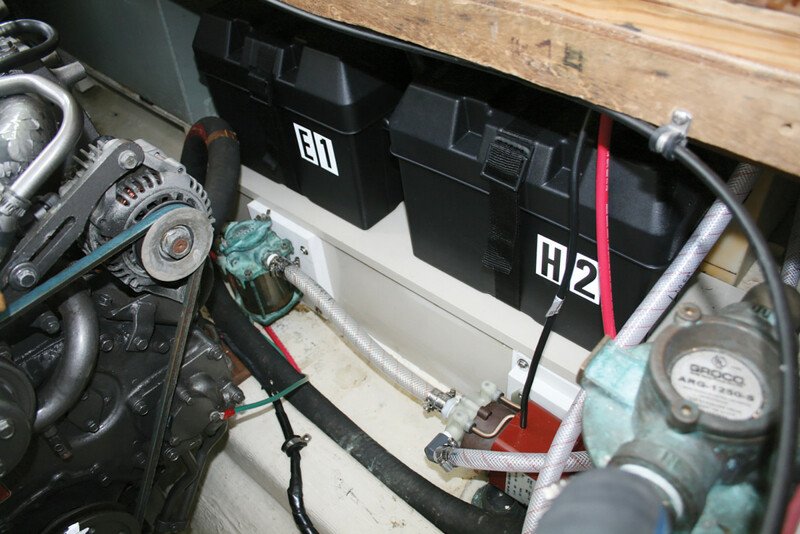 It’s no secret that marine air-conditioning units, especially those of the self-contained variety, are reliable and long-lasting. Perform a few maintenance chores regularly and you’ll be rewarded with years and years of trouble-free service. But it’s also no secret that almost all technology improves over the years—machinery, whether air-conditioning related or not, typically evolves, ultimately becoming more efficient with the passage of time, as well as easier to use, maintain, and install, and less intrusive in terms of size and weight. 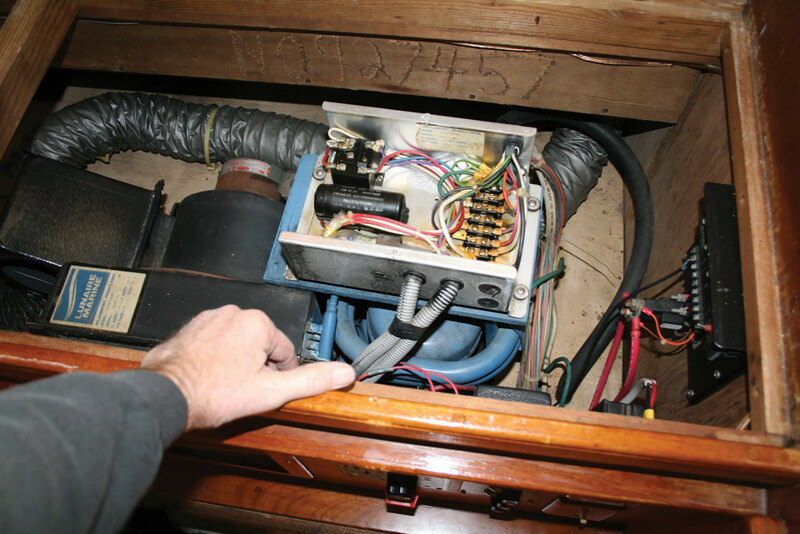 So, it stands to reason, I’d say, that the average boat owner will, at some point in the future if not now, need or want to replace an older, self-contained air-conditioning unit with a new one, either because the old one no longer works well (or at all) or because it cries out for a serious up-to-the-minute update. 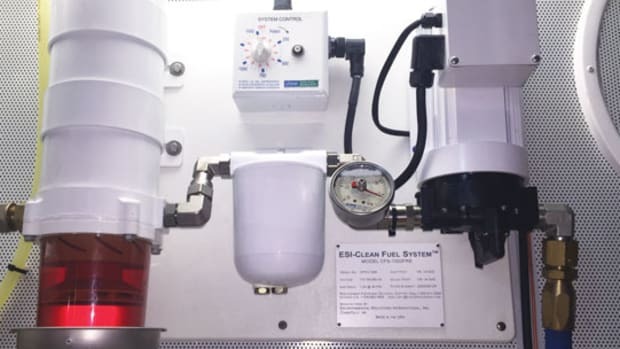 A great candidate for such a swap is a Mini-Kool Series self-contained marine air-conditioner from Aqua-Air Manufacturing of Hialeah, Florida. 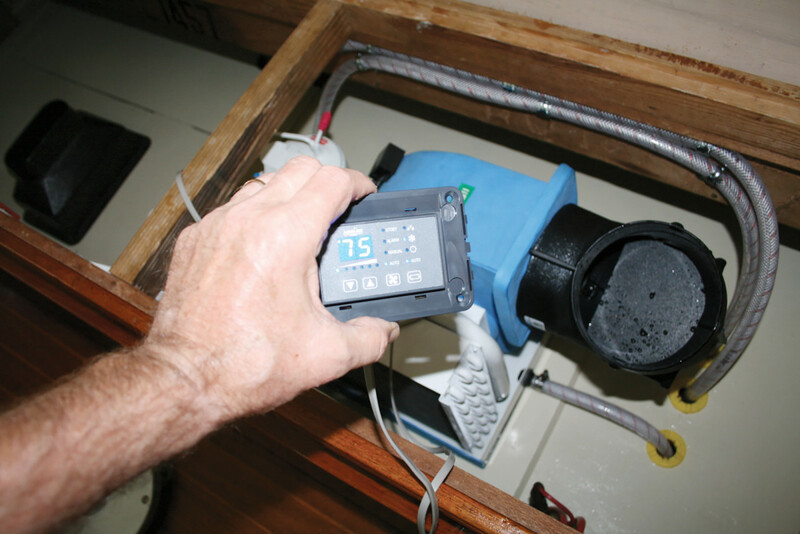 Not only is the Mini-Kool super-efficient by comparison with units sold in the past by Aqua-Air as well as its competitors, it’s also much easier and more accurate to operate (thanks to a smooth, modern digital thermostat), faster to chill, and way more elegant in terms of size, weight, and engineering. I know all this to be true because, just recently, I hauled an ancient, defunct, 16,000-Btu Lunaire behemoth from under the L-shaped settee in the Betty Jane II’s salon and supplanted it with a brand-new, lightweight (68 pounds), comparatively small (20 inches by 12 inches by 13 inches), 16,000-Btu Mini-Kool unit. And hey, the machine is both cooling and heating like gangbusters. On the following pages are the highlights of my installation with photos and explanations. 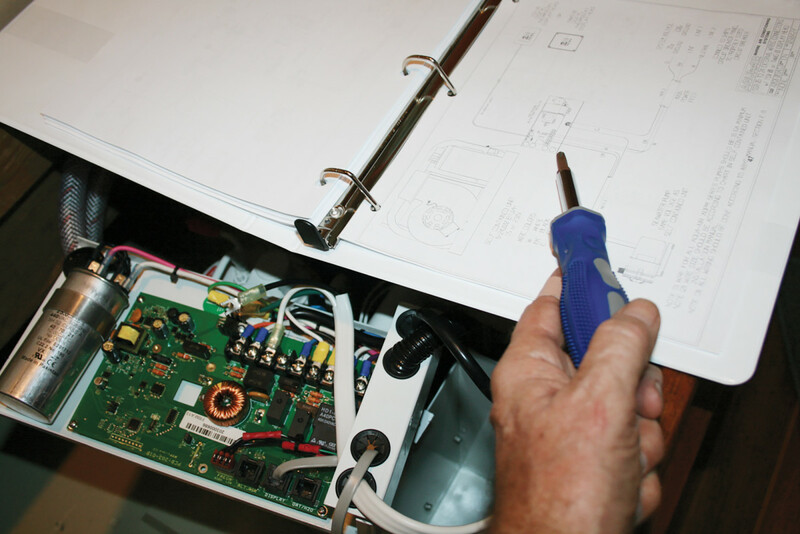 Essentially, replacing an old self-contained air-conditioning unit with a new one is a simple, weekend job involving little more than a few basic tools (screwdrivers, wrenches, an electrical tester, and components, etc.) 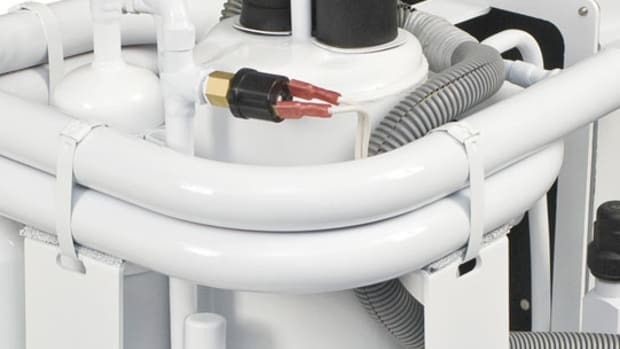 with which you disconnect and then reconnect inlet hoses, outlet hoses, and electrical wiring. My own take on the task, as you’ll see, turned out to be a bit more complicated, however, primarily because the cabinetry around the new unit had to be rehabilitated and some of the associated accessories (like the old Perko sea strainer that needed a rebuild and the 500-gph water pump that needed replacement) had to be dealt with. Please bear one thing in mind as you proceed. At the start of the project, I was advised by Aqua-Air President DeWayne Nall not to stick with Betty’s original ductwork routing when I installed the new stuff I purchased, mostly because this would place the supply-air grill in the fascia under the settee only inches off the deck and just a couple of feet from the return-air grill. 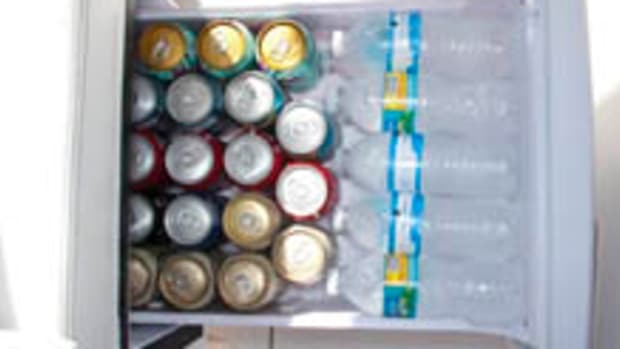 Cooling efficiency, Nall warned, would be hindered by the arrangement. Nevertheless, because wraparound windows in the salon kept me from coming up with an easy way to move the cool, return-air flow to a higher level for a better, more conventional, warm-weather air-conditioning situation, as Nall suggested, coolness still prevailed within the Betty Jane II’s relatively confined living spaces, even in the midst of a hot Florida summer. It was a two-man job extracting the old, super-heavy Lunaire unit from the compartment under the settee. Old ductwork, water hoses (inlet and overboard discharge), and electrical wiring were also removed. 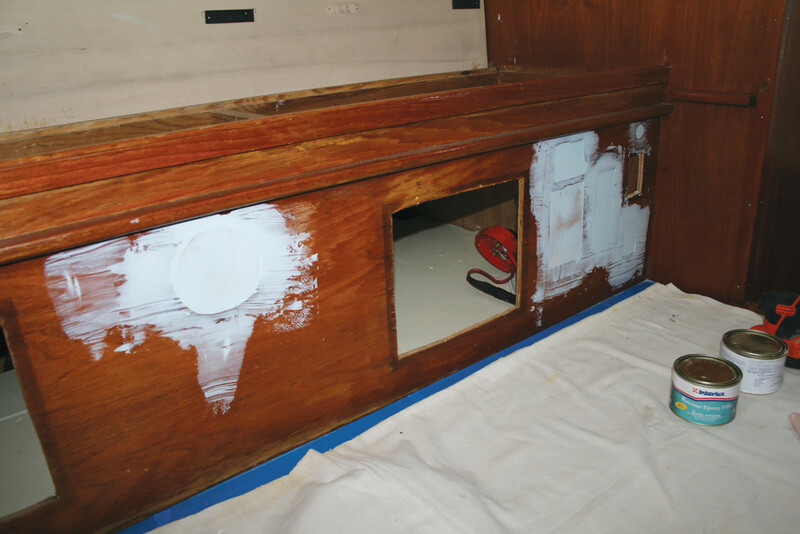 The compartment itself was then cleaned and painted out with two coats of durable Rust-Oleum “Gloss Almond” oil-based paint. Old holes in the settee’s fascia (for switches, electrical outlets, a stereo speaker, etc.) were filled with plywood plugs and surfaced with Interlux Watertite epoxy filler. The hole accommodating the old return-air grill was enlarged slightly to make way for a new teak grill. And the hole for the old supply-air grill was similarly dealt with. Mahogany veneer was applied to the fascia, then lightly stained, and varnished with Awlgrip Awlspar. New supply-air and return-air grills were fitted, along with a new GFCI electrical outlet and a new Perko selector battery switch. The relatively short distance between supply and return grills was advised against by Aqua-Air. 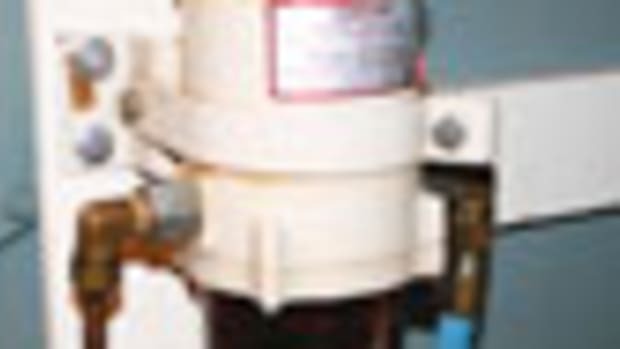 After the Perko sea strainer was rehabilitated via new cork gaskets and a new clear-polymer cylinder, the original 500-gph air-conditioning pump was swapped for new and rewired. New bronze barbed fittings were added to the strainer and new nylon barbed fittings were added to the pump. New water hoses were added as well. Dealing with the electrics for the new unit was a snap, thanks to a manual (with easy-to-understand schematics) that accompanied the Aqua-Air. A new 30-amp circuit breaker was fitted to protect the incoming electrical power circuit and input wiring was upgraded from 12 AWG to 10 AWG. 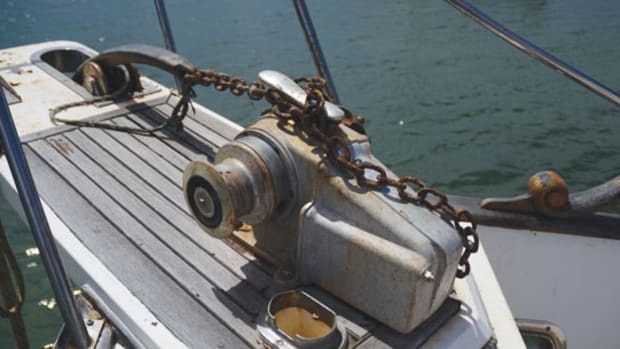 Water hoses and supply and overboard discharges were immovably secured and suspended on metal hangers. 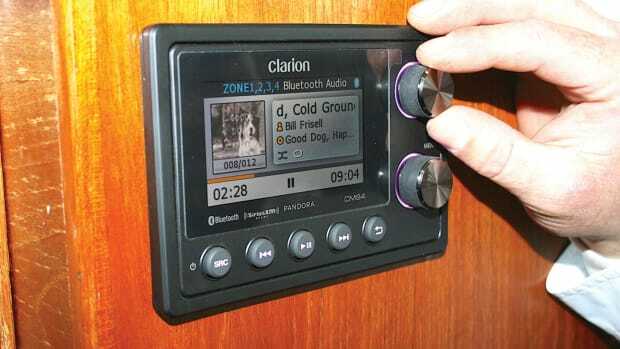 A TSV digital thermostat produced instant success. New insulated ductwork was then run from the unit to all supply grills, including in the head and stateroom. Total project cost: $2,095. Itemization: $1,443 for A/C unit; $247 for pump; $305 for teak grills, transition boxes, and duct; $100 for additional parts. 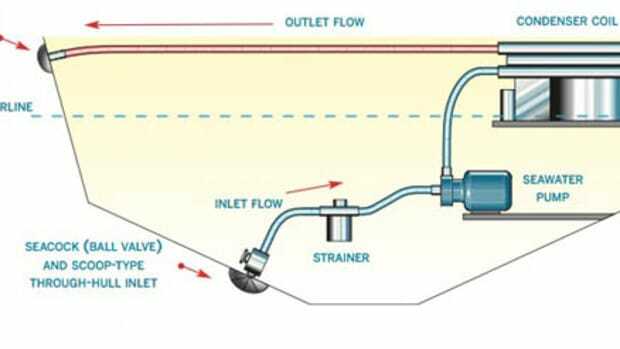 To simplify and economize, buy a complete install kit (pump, strainer, etc.) for $579. 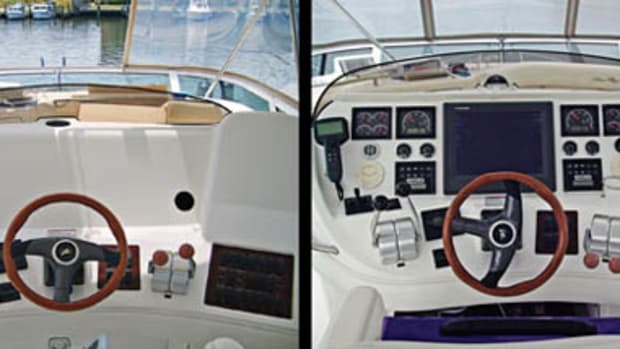 This article originally appeared in the February 2018 issue of Power & Motoryacht magazine.